As I planned my Listening Walks for the Holy Week, I remembered this blog post that I read a few months ago. I loved the way Pam weaved the stories about her neighbors around a walk with her dog. I’m delighted to reblog this post today on Reblog Monday. I clip the leash onto the collar of my wacky little dog, Greta, and pull open the back door. Greta stiffens, and I look down to see Maxie, the new mayor of the neighborhood, standing expectantly outside the storm door. Maxie is a black cat with a priest’s collar; his head is the size and shape of a squashed softball. He is sleek and talkative. He waits in the ivy, under the shrubs that line the drive, when I come home. 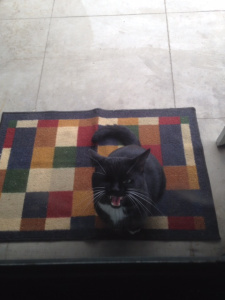 As soon as I open the car door, he starts his approach, spouting a long line of complaints: Yowlyowlmewwwwrrrryowlyou!MEW. He always ends decisively, waiting for a response. I usually give him a little piece of frozen turkey from a baggie in the freezer; he accepts this, but seems none too thrilled. Rosanna, thank you so much for this! It’s more than an honor to appear on your blog! Likewise, Pam, it’s an honor to be able to feature such a great post in my blog!